First held in 1929, the world's oldest and most exclusive concours d'elegance celebrated its 80th anniversary this year. 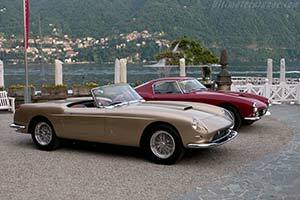 It was far from the only anniversary celebrated during the 2009 edition of the Concorso d'Eleganza Villa d'Este. Others included the 10th anniversary of BMW's patronage, the 80th anniversary of BMW as a car manufacturer and the 100th anniversary of the Morgan and Bugatti marques. Fortunately all the celebrations were low key, leaving most of the limelight to the fifty historic and eight modern concept cars actually entered in the 'Concorso.' These were lined up on the beautiful grounds of the Villa d'Este hotel, located on the shore of Lake Como in the Northern tip of Italy. Here they were scrutinized by both a panel of expert judges and the public, who at the end of the day would each pick a best of show. Although there was an outright favorite from the start, the choice was never going to be easy thanks to an excellent selection of vehicles invited by chief selector Urs Paul Ramseier. Among the modern cars invited there were no fewer than three world premieres. The Pre-War cars entered were divided in three classes. In the class for open cars three cars really stood out. 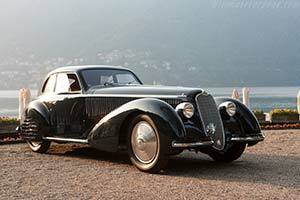 The first was Gabriele Artom's Alfa Romeo 6C 1750 GTC, which his family has owned for over four decades. The carefully preserved supercharged Alfa was reunited with the daughter of the first owner. A marine officer, he used the car to visit her mother on the weekends. As the master of ceremonies Simon Kidston pointed out; without the car she probably would not have existed. Needless to say it was a very emotional re-acquaintance for her. The second open car of great interest was a Lancia Astura bodied by little known coach-builder Boneschi. According to owner Klaus Edel it was the very first European car fitted with a power convertible roof. 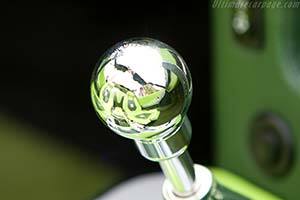 While classic cars are often greatly cherished by their owners, they rarely become an heirloom. 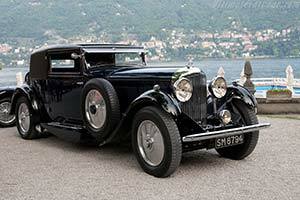 An exception was the very original Bugatti Type 57C Aravis that was bought new by the current owner's uncle. He in turn was gifted the car in the 1950s and now the third generation of the family regularly takes the rare Bugatti out. Some years ago a collector offered two very early SS cars. The first was the SS 90 prototype (also entered here), which sold within six minutes. The second was a SS 1 Four Light Saloon in a rather derelict condition. In stark contrast it took a whopping six years before a new owner was found and even longer before it was fully restored. Most of the work was down by owner Andre Wallimann himself and the breathtaking result could be admired for the first time at Villa d'Este. Also a labor of love, although lasting only three days, was Frans van Haren and his wife's trip with his Bentley 8 Litre from the Netherlands all the way to Villa d'Este. The 1000+ km effort was sufficient to win him the 'Trofeo Automobile Club de Como' for the car driven from farthest away. As mentioned earlier the SS 90 Prototype was also entered in the show. Effectively the first 'Jaguar' sports car, it was entered by Swiss Jaguar enthusiast Christian Jenny. He went one better than last year when he brought the first production SS 90. An odd one out among the European cars in the group was Andrew Pisker's Auburn 852SC Speedster. Seemingly twice the size the of its 'classmates,' it nevertheless appealed to the judges as it was awarded best in class. The cars in this class just spawn six years but represent two different eras. The Bugatti Type 101 and Alfa Romeo 6C 2500 SS were both based on Pre-War designs while the two Bentley R-Type Continentals and Ferrari 250 GT Europa were Post-War developments. The factory bodied Fiat 8V also present in this class was the odd one out in more respect than one; firstly it was actually developed in great secrecy during the War, and also it is unusual because it sports a Series I style nose while underneath the car is a Series II. 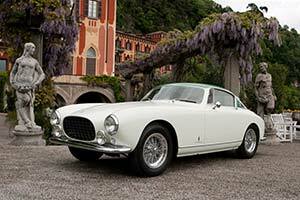 Entered by Kenneth Roath, the Ferrari was freshly restored by the Ferrari Classiche department. In keeping with the company's certification program, the car was fully brought to its original configuration. Pininfarina's archive was extensively researched to get the correct white and green color combination. The jury appreciated the work and awarded it with the Trofeo BMW Group Classic for the most sensitive restoration. As per a special request by chairman of the jury Lorenzo Ramaciotti a special class was created for the great cars built in the Modena area (Ferrari, Lamborghini and Maserati among others). Despite the presence of a Zagato bodied Maserati, a Ferrari 250 GT SWB and the ex-Steve McQueen Ferrari 250 GT Lusso, all eyes were on the Lamborghinis. 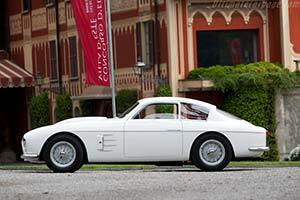 In particular Paul Roesler's 350 GT, which is the oldest production Lamborghini in existence and the first example sold to a customer. Quite in contrast with the later Lamborghinis, it is an understated Grand Tourer that proved to be more than a match for its contemporaries. Roesler not surprisingly walked away with the class award. In 2002 disaster struck when a barn containing among others a very rare Ferrari 250 GT Series 1 Cabriolet burned to the ground. The remains of the car seemed unsalvageable but Peter McCoy begged to differ. He bought the remains and the engine, which fortunately was not in the car at the time of the fire. Wayne Obry's Motion Products spent the next couple of years carefully restoring the car. A wooden buck was created over which the surviving body was draped into its original shape. An amazing 75% of the original panels could still be used. Painted its original 'Andalusian Gold,' the end-result is nothing short of breathtaking. McCoy deservedly won the class price. he loudest class by far was reserved for early 1950s racing cars. The oldest car was Mark Gessler's Abarth 204A, which just like McCoy's Ferrari, was brought back like a phoenix from the ashes. Next to it was Jan de Reu's Zagato bodied Fiat 8V, which features the only surviving example of five special competition engines built by Fiat. Breathing through through two massive quad-choke carburetors, the small V8 is estimated to produce 170 bhp. That's about half of what the massive 5-litre V12 in the engine-bay of Jon Hunt's Ferrari 410 S develops. Built for then Ferrari board member Michel-Paul Cavallier, this one-off combines racing car running gear with a luxuriously appointed fixed head body by Scaglietti. Rounding off the unusual package was an equally rare cream-white paint scheme. Regular Villa d'Este entrant Peter S. Kalikow wowed the crowds with one of the six Momo Mirages he had built back in 1972. Although destined for production, Kalikow pulled the plug before a single one was sold. He still owns all five surviving examples. The car he brought to Villa d'Este was the second car built and the production prototype. Never shown in public before, it effectively made its world debut. Next to it was the even rarer and far more unusual BMW 2800 Bertone 'Spicup.' The name is a combination of the words Spider and Coupe and refers to the sliding roof. Although built as a show car back in 1969, it was subsequently used on the road. It eventually completed over 100,000 km before the current owner had it restored. The green and silver of the exterior is also found in the rather loud interior. 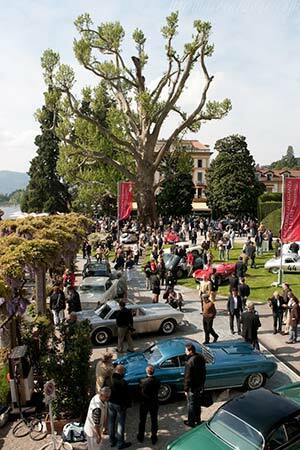 In the spirit of the original Concorso d'Eleganza, Villa d'Este also welcomes current concept cars and prototypes. Three of the cars that lined up in front of the hotel were world debuts. 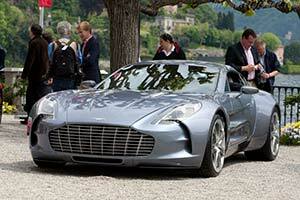 The most prominent and loudest (in more respect than one) was Aston Martin's One-77. It was the first time a fully functional version of the one-million pound supercar was shown. Production is set to commence early in 2010. Stile Bertone was back after a very difficult period with the Jason Castriota (of Ferrari P4/5 fame) penned Mantide (Italian for Praying Mantis). Although perhaps not to everyone's liking, the wild Mantide is considerably lighter and 25% more efficient than the Corvette ZR1 it is based on. The third world debut was the Morgan Aero SuperSport, built to celebrate the company's centenary. It will not be a one-off as production will commence in 2010. The run will be limited to around 200 cars. Traditionally the best of show (awarded with the Coppa d'Oro) at Villa d'Este was chosen by public referendum. More in line with the other major concours, the 'modern' Villa d'Este also has a best of show by jury vote (awarded with the Trofeo BMW Group). Usually the public and jury do not agree but for the first they came to a unanimous decision and awarded the best of show to Jon Shirley's superb Alfa Romeo 8C 2900B Touring Berlinetta. Having won the best of show at Pebble Beach in 2008, the dark blue Alfa was already the top favorite. With Ralph Lauren's Bugatti Type 57 SC Atlantic Coupe a clash of the titans was expected. Unfortunately the equally impressive Bugatti was withdrawn right before the event. Generally considered the first supercar, the 8C 2900B combines a Grand Prix derived chassis with a very beautiful body built by Touring of Milan. Shirley completed his 'clean sweep' by also winning the public referendum the next day at Villa Erba. A full list of winners can be found here. As we have become used to Urs Paul Ramseier once again selected a thoroughly impressive field of cars. Although the overall winner was no surprise, few could have expected the Alfa Romeo to win all three best of show prices. It would have gotten our vote as well, so it's hard to argue against. The weather gods were kind enough to keep things dry on Saturday, which was quite a contrast with the very wet Friday before and Sunday after. The pleasant weather helped us shoot the event in its entirety and all of the cars entered have made it into our exclusive 200-shot gallery. Report by Wouter Melissen and images by Wouter Melissen and Pieter Melissen for Ultimatecarpage.com.